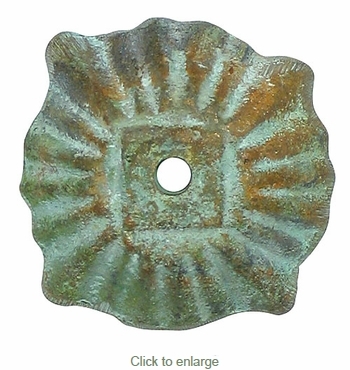 Our rustic patina bronze shell rosettes are all handmade by Mexican artisans. This bronze hardware makes a unique accent for our rustic pine furniture pieces. Each piece is forged bronze that is hammered, cut and finished by hand. Each rosette comes with a 4.5" bronze-head nail. Expect some variations in size and finish.